It’s been another harrowing week on planet earth. The terrible atrocities in Paris and Nigeria (and elsewhere not covered by the media) have again functioned as the exclamation mark for the statement of our times – of threat, fear, violence and deceit – churned out from terrorist groups all around the world: “we will strike anywhere; you are not safe”. I don’t know about you but I have a world-view that includes a conception of a spiritual realm – that beyond the world that we see and touch and taste and hear, there is another ‘more real’ world…the world of the infinite. This isn’t a world of confusing and sad-feeling interstellar realities, or of the actual post-code of the Lady in Black; it is an actual realm of angels and demons and of armies of both. You may or may not believe in ghosts – I do – though not Casper ghosts or any kind of ghost that can be ‘busted’ by Bill Murray or Dan Aykroyd. I believe in a spiritual dimension comprised of a Triune God, One God in perfect oneness and yet divisible and individually knowable in Three Persons: – The Holy Ghost (The Holy Spirit), Jesus Christ the Son of God and the The Father. I believe in a Triune God like this because the bible tells me that He is so. The bible also tells me that angels and demons (try not to hear that as a Dan Brown novel title) are a major part of the unseen spiritual realm: angelic hosts that worship God and do his will and demonic spirits that wage war against the purposes of God in heavenly places and on the earth. These are some of the ‘big stories’ from the ‘big narrative’ of the bible and you can find it for yourself if you don’t believe me. You may or may not believe in ghosts and you may or may not like Russell Brand as a comedian or as a social commentator and wannabe Political Maverick. I do. I find him very funny and very entertaining even when he comes across as a bit of a wolly on Question Time arguing with Nigel Farage. I appreciate Brand’s desire to challenge the status-quo and the institutions of our day, seeking something better, effective and something fairer for society. I also read with interest his propositions of the ‘territory of the spirit’ and ‘manifestations of the infinite’ (phrases that I love and will unashamedly steal) that I have been talking about, above. 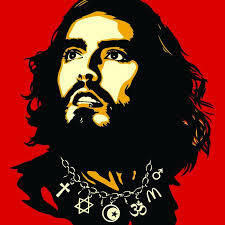 His latest blog article about events this week in Paris (http://www.russellbrand.com/2015/01/paris/) include his meditations on a spiritual realm and on causes and solutions for the mind-numbingly tragic terrorist attacks we sadly see so regularly now. The thing is, Brand is hitting the nail on the head – kind of. I do believe that Brand is a spiritual man, and I believe he’s seen spiritual realities, but I don’t think he would call himself a Christian, i.e. a follower and lover of Jesus Christ. Maybe he would. But the point is, the vagueness with which he talks concerning the spiritual world tells me that he is searching and looking but isn’t quite there yet. That’s not supposed to be patronising it’s more of an interpretation of his pluralistic necklace, above, if nothing else. I think sometimes, as Jesus lovers, we forget the colossal privilege and insanely exciting reality we get to live in day-in-day-out: as Ephesians 1 says, that the mysteries of His will have been made known to us, or revealed to us, so that (as Colossians 1:9 says) we are filled with the knowledge of His will. Quite simply, breath-taking: we get to go through life with an over-flowing knowledge of His will! This leads us to approach the evils in Paris this week, and on a larger scale in Nigeria, with God’s viewpoint, not just ours – with His will in mind, not just ours. The tug of war that we see playing out in the Nations of the world are because of the tug and war that is happening in the ‘heavenlies’. The great Apostle, St Paul, tells the church in Ephesus that their struggle (whatever their struggle was) is not against ‘flesh and blood’ but against the rulers, against the authorities, against the cosmic powers over this present darkness, against the spiritual forces of evil in the heavenly places (Eph.6:12). By faith (and historical enquiry) these Scriptures inform my world-view (or cosmos-view) more than anything else meaning that what we are seeing in the Nations of the world are a reflection of an unseen reality that the bible calls the heavenly places. But we do, Russell, we really do. And so can you. That’s why the bible is the number one selling book in the world. That’s why the bible is more historically sound than any other book in the entire world. That’s why billions of people across the world would die for the words printed in its pages. The bible is not, as pluralistic Great Britain would have us believe, one option amongst many. It is the only option, as ludicrous, arrogant, unfortunate or unpopular as that may be. We see the events in Paris and so we pray. We see the events elsewhere that point to a greater battle, and we pray. There is a territory of the spirit, and there are manifestations of the infinite, but we must be filled with a knowledge of His will for us to know how to respond in these unfolding days.